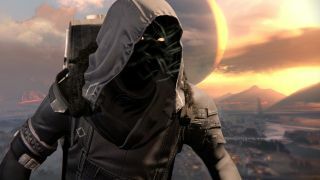 Destiny: Xur weapons, gear, and location, July 28 - 30. Bad Juju and Telesto! Xur, Destiny’s travelling weekend Exotic trader, impassioned trampoline historian, and manager of the system’s foremost, all-squid, Beautiful South tribute band (Perfect Tentacle available for Christmas bookings right now), is back. This week he’s in the Tower, near the Crucible vendors. He’s not saying much, but he does seem particularly observant today. Perhaps he’s trying to pick up tips for a tournament of his own. Well in terms of armour, Titans win this week, but only as long as they use shotguns regularly. No Backup Plans triggers Force Barrier for every buckshot takedown, meaning that rushdown tactics gain a massive boon. Couple it with the Defender subclass’ War Machine and Relentless perks, and you’ll be a rampaging monster. The Hunters’ Skyburners Annex is a fairly unspectacular support Exotic, simply offering more super energy and the chance of orbs on Heavy weapon kills, and dropping more super energy for PvE kills in general. The Warlocks’ Starfire Protocol is better, equipping a second Fusion Grenade on every charge, but it’s still pretty specific in its purpose, and far from the most exciting Warlock Exotic out there. If you’re looking for a Sunsinger-specific piece of armour, go after Heart of the Praxic fire. The guns though, are much better. No Land Beyond is very much an acquired taste, being a bolt-action, single-shot reload sniper rifle that, unusually, goes in your Primary slot. It takes a fair bit of work to get real results out of it, but despite initial distrust, many Crucible players now absolutely swear by it, In the right hands, it’s can be very effective indeed. Bad Juju is a marauding horror-show of a pulse rifle, fast, accurate, firing in full-auto, and possessing of a delicious little predilection whereby it will instantly reload, increase its damage, and pour bonus charge into your super meter on each and every kill. And Telesto? That’s a Fusion Rifle that was raised by grenade launchers, and now refuses to accept any other way of life. Its projectiles, you see, are sticky, and will detonate a couple of seconds after impact with a target. It is also good, and deliriously, eye-rollingly fun, and you should also very much buy it. As ever, Xur will be around until 10am UK / 2am PT on Sunday, at which point he’ll be away for the week. To make plans. To concoct dark, venomous schemes. Or maybe he’ll just get smashed up on homemade cocktails until next Friday. It depends on what the weather does, really.